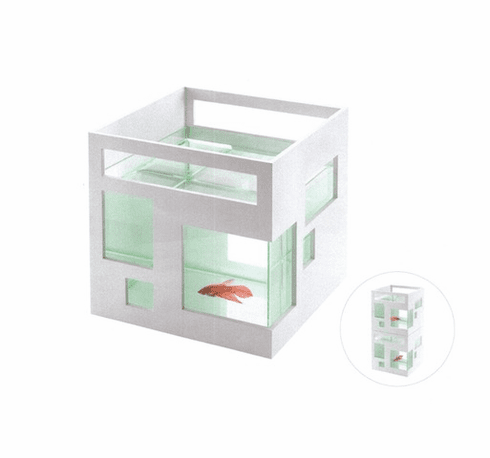 Built to give your small fish a modern, stylish home, the Umbra FishHotel is a beautiful aquarium that lets you stack others on top of it to maximize space. Stack several FishHotels to create a great-looking fish condominium in your office or home. Winner of Canada’s Build A Better competition and designed by Teddy Luong, the FishHotel features a square glass bowl surrounded by a paintable ABS plastic façade with asymmetrical windows. You can even remove the façade if you want to just feature the glass aquarium. Easy to clean. Top is uncovered. 7.5 x 7.5 x 8 inches. 5 pounds. Fish not included.